Portraying airflow over wings and other fluid movement is tricky. A Department of Energy award for early-career researchers is helping a former DOE CSGF fellow devise mathematical methods to decrease the error rate in fluid modeling. 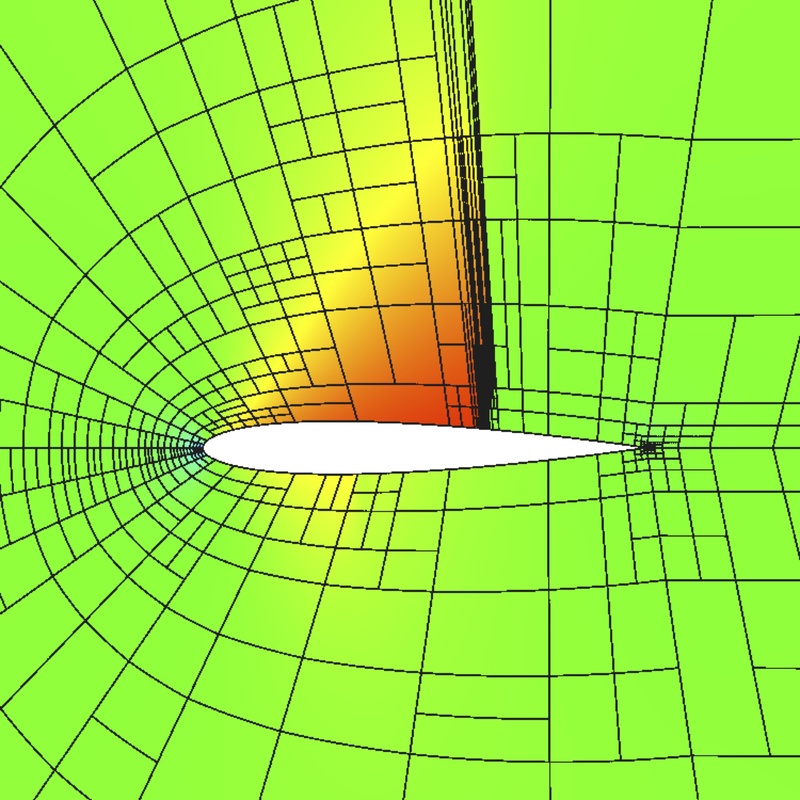 This test shows a solver’s anisotropic adaptive capability applied to a two-dimensional transonic simulation. In this case, a shock forming on the airfoil’s upper surface is most efficiently refined by elements that are long in one direction (along the shock) and short in the other direction (perpendicular to the shock). The adaptive algorithm automatically identifies which elements must be refined and the most efficient direction of refinement, using a metric that includes the accuracy of a computed output and the simulation’s computational cost. Airplane travel is different for Krzysztof “Chris” Fidkowski than for most people. As an assistant aerospace engineering professor at the University of Michigan, he uses high-performance computers to simulate airfoils and aircraft, and to seek better ways to calculate bigger fluid dynamics problems. Shocks and other flow phenomena are just what Fidkowski simulates. Yet it’s impossible to capture each air molecule’s movements, “so we’re always making approximations to the fluid dynamics and that gives us errors” – the plus-minus that defines the output’s accuracy. Fidkowski, a native of Poland who dreamt of becoming an astronaut, focuses on cutting error by adapting the computational meshes researchers use to analyze things like airflow over wings. “We have the capability to reduce that error bar – that plus-minus – in fairly straightforward ways,” usually by putting more mesh points in areas important to accurately predict an output. This spring, Fidkowski’s work on error estimation and mesh resolution earned him an Early Career Research Program award from the Department of Energy’s Office of Science. The grant supports scientists in their early years, when they do their most formative work. In a paper with graduate student Marco Ceze, Fidkowski describes an anisotropic hp-adaptation framework to cut output error. Like many fluid dynamics simulations, it focuses on the boundary layer – the critical, super-thin blanket of air nearest to the aircraft wing or body. Simulating airflow over the entire aircraft with an isotropic mesh small enough to resolve the boundary layer is far too demanding for even the best supercomputer. Instead, the algorithm makes boundary layer mesh elements anisotropic – flattened in one direction ­– with the hp-adaptation method flagging and refining those generating the most error.